Under California’s implied consent law, all drivers are required to submit to chemical testing if arrested on suspicion of DUI. Those who refuse testing can still be charged with driving under the influence pursuant to California Vehicle Code Section 23152(a) VC, however they would also be subject to the refusal enhancement under California Vehicle Code Section 23612 VC which would increase penalties on any conviction. A peace officer asked the defendant to submit to a chemical test to determine his or her blood alcohol content or whether he or she had consumed drugs. AND the peace officer lawfully arrested the defendant and had reasonable cause to believe that defendant was driving a motor vehicle while under the influence of alcohol or drugs. That he or she may choose a breath or blood test and may be required to submit to blood testing if he or she consumed drugs. That he or she does not have the right to have an attorney present before saying whether or not he or she will submit to a test, during the decision of which test to take, and during the administration of the test. That if he or she refuses to submit to a test, the refusal may be used against him or her in court. AND failure to submit to testing will result in an automatic driver’s license suspension of one year or a revocation of driving privileges for two or three years. Submitting to the PAS test does not satisfy a DUI defendant’s requirement to submit to chemical testing and would not prevent a subsequent refusal enhancement. The officer must ensure that the defendant is able to hear and comprehend the admonition. However, where the defendant’s own conduct or intoxication prevents comprehension of the admonition, he or she would still be held responsible for any subsequent refusal. When the defendant, through no fault of his or her own, is incapable of understanding the admonition or of submitting to the test, the defendant cannot be penalized for refusing. 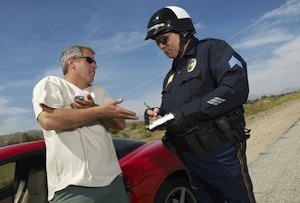 A man is stopped by police after he is observed committing several Vehicle Code violations while driving. The man fails all field sobriety tests and provides a PAS test with a BAC in excess of 0.20 percent. He is arrested and brought to the police station where he is read the DUI admonishment. However, the man is so intoxicated that he does not understand the admonishment and does not agree to testing. The man could still be charged with DUI in violation of California Vehicle Code Section 23152(a) VC and the refusal enhancement pursuant to California Vehicle Code Section 23612 VC. The fact that he could not understand the admonishment because he was so intoxicated would not be a valid defense. Additionally, the fact that he submitted to testing on the PAS device would not satisfy his requirement to submit to chemical testing under California’s implied consent laws. As described above, if the defendant was unable to understand or hear the admonishment due to factors outside of his or her control, he or she cannot be held responsible for the subsequent refusal. Thus where there is external noise, such as radio traffic from an officer’s vehicle, that prevents the defendant from fully hearing the admonishment or if he or she is unconscious, the refusal enhancement would not apply. For a person’s first DUI, the refusal enhancement adds two days in jail, the 9-month alcohol program and a one year driver’s suspension with no ability to get a restricted license. If it is the defendant’s second DUI, the refusal enhancement would add an extra 96 hours in jail and he or she would be subject to a two year driver’s license revocation without the ability to qualify for a restricted license. For someone’s third DUI, the refusal enhancement adds 10 days in jail and a three year license revocation without the possibility of a restricted license. If you have been charged with a DUI offense in Los Angeles and there is an additional refusal allegation, it is critical that you speak with a Los Angeles DUI Attorney immediately. Los Angeles DUI Attorney Michael Kraut is a former Deputy District Attorney with over 14 years of prosecutorial experience who is highly regarded throughout the court system as a skilled litigator who knows how to effectively fight DUI cases. Mr. Kraut works hard to ensure his clients receive the best outcome possible and avoid devastating penalty enhancements. For more information about the refusal enhancement, and to schedule your free consultation, contact Los Angeles DUI Lawyer Michael Kraut at the Kraut Law Group located at 6255 Sunset Boulevard, Suite 1480, Los Angeles, CA 90028. Mr. Kraut can be reached 24/7 at 888-334-6344 or 323-464-6453.